Semi-pro zero turn mowers feature horsepower and cutting widths similar to smaller commercial-grade models and higher-end mid-grade models. However, when it comes to comfort and convenience, semi-pro models share more similarities with their commercial cousins. Taller seats, comfortable arm rests, and more advanced controls place semi-pro models a step above mid-grade. How many acres do you need to mow? The answer to this question will help you decide the correct deck size. 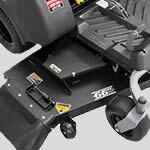 As a rule of thumb, the wider the deck size, the faster you mow. All semi-pro zero turn riding mowers include the step-up performance and comfort features found on a mid-grade zero turn, and then some! Features include heavy-duty, welded steel decks, larger rear tires, larger fuel tanks and more cutting height adjustments just to name a few. 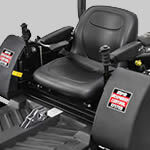 They're typically found with more comfortable seating and controls, and in some cases more advanced control panels. 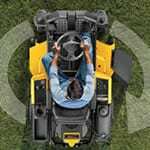 Semi-Pro Zero Turn Mower Buyer's Guide.. Our Power Equipment Direct how-to library can help you learn about How to Fertilize Your Lawn, Vote for Your Favorite Brands in Mower Madness 2019 and Official Mower Madness Contest Rules.